Example: Acoustical resonance of different frequencies in a cello. 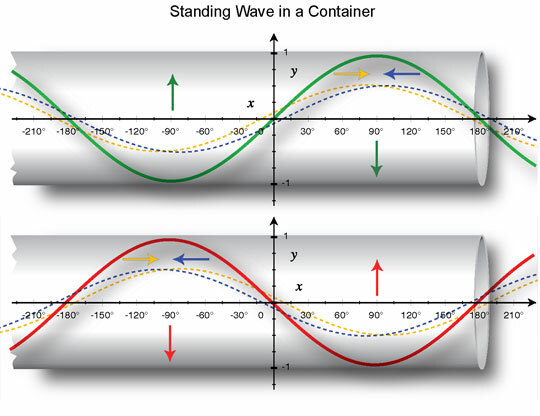 As waves reflect in a container, the prime resonant frequency reflects back on itself (adding and subtracting in opposition) to create a stationary oscillating wave pattern. Similarly, all interference patterns are composed of standing waves that are similarly stable and stationary as well. As a standing wave forms, additional waves can form in the same medium. 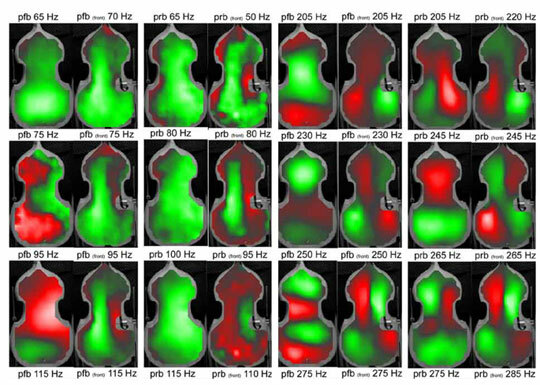 These waves are called 'harmonics,' 'wave partials' or in music 'overtones.' Harmonic partials to the standing wave are not random frequencies, but instead whole number multiples (1x, 2x, 3x, … nx) of the prime resonant frequency. This is called the harmonic series. This is what the harmonic series looks like when both opposing phases of interference are superimposed at a constant energy level or amplitude. Notice the stable pattern it creates and the gaps that form around the nodes and other locations. This is universal to all kinds of waves as they 'resonate' inside some container. Question is, what causes standing waves to form in such a regular pattern? What is the underlying physics that prevents fractional or enharmonic waves from forming on the prime resonant frequency?